Besides heading to Pondy Bazaar and the malls to pick up jewellery, the next best market is Instagram. These four Chennai-based online jewellery stores have everything from bridalwear, silver jewellery, kemp and fusion jhumkas on offer. Check out their Instagram handles and get shopping. Like The Mask would say in the movie, "Somebody stop me." A jewellery enthusiast, SuviTamara is the brainchild of Doncy S. With a background in handmade jewellery, Doncy wanted to make sure she had a variety of jewellery to offer to her customers. From jhumkas, necklace sets, bangles, guttapusalu, there's a lot to choose from. But what is selling like hot cakes is their pure silver nose pins, jhumkas and toe rings. Their dainty silver daily wear are also delights that one must own. They have a special series of hand painted bell jhumkas with polki studs which is available in different colours and is perfect for your traditional attire. Their earrings start from INR 75 and several celebrities like Nakshathra Nagesh, Ahana Krishna have adorned their jewellery. When Ahbbinaya Vijayakumar started her Instragram page, Nakshatra, her motto was affordable jewellry available to all. An ardent online buyer, Ahbbinaya is a jewellery lover and thus entered the business world. She works closely with artisans from Jaipur, Mumbai and Kolkata. But besides costume jewellery, what they have is an exclusive line of kemp that is made by artisans in Chennai. From Lakshmi haram, matte finish gold set, kemp jhumkas, antique finish grand Lakshmi pendant, kemp layer necklace, they have a lot of variations in the kemp series itself. Their gold concha pearl bunch temple set is a popular piece and is sold out most of the time. That explains why actress Regina Cassandra likes their designs. Their jewellery starting from INR 100 is sure to be budget-friendly as well. Exclusive designs, costume jewellery, traditional jhumkas, kemp sets, kundan sets, pearls and tassels, Anicha has a lot of unique and niche pieces that is hard to resist. 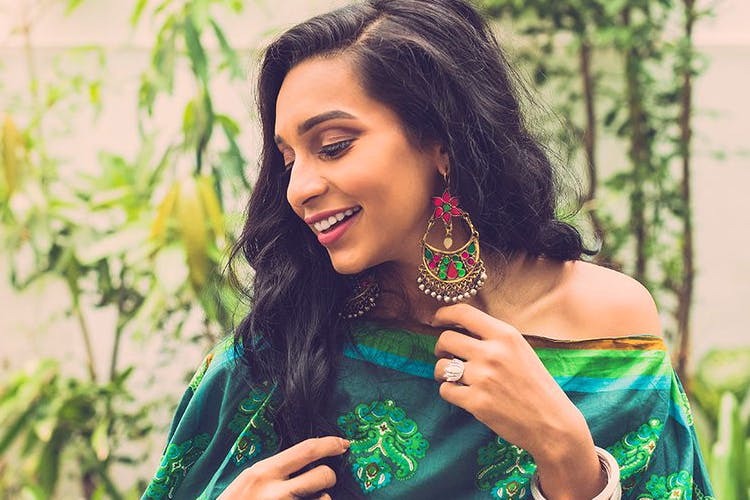 Started by Aishwarya Karthik and Hema Arvind, one of the best features of Anicha is that they have a mix of both traditional and modern jewellery. While you might find a kemp set that can be paired perfectly with a Kancheepuram silk, they also have a butterfly chain earring that can be paired with a dress. Their pompom and tassel earrings are popular as well. With an A-line celebrity list like Janani Iyer, Manjima Mohan, Nikki Galrani, Aathmika DD and Kiki, we now know where the celebs go shopping. And the best part? They are all budget-friendly and begin from INR 150. They are all about the jhumkas and we totally vouch for it. pure silver, gold-based, hand painted, German silver, they have them all. When Amritha Menon started HOJ, the aim was to make jewellery that was affordable to the college crowd. So their jhumkas begins from INR 150. She makes sure her designs are ethnic and are mostly sourced from Jaipur and Bombay. Their latest collection of enamel jhumkas are a must-have. We totally love their Suryakanti plus Radhe Krishna pure silver jhumka. Have you checked out their crystal oval jhumka? They are all heart. Go check out their page while we confuse ourselves on what to buy!